Here's a look at the opening pair of marquee match-ups for Saturday, April 7. The feature game slate kicks off with an East Coast clash between NWSL-affiliate NC Courage and Connecticut-based Oakwood Soccer Club. Both teams currently stand just inside the edge of playoff position and feature some of the top goalscorers in the East Conference. While the Courage got off to a slow start this year, they've begun to catch fire as of late, losing just twice in their last 16 games. Head coach David Maddren has seen improvement all season from the Carolina club as his players learn to take on a variety of competition. The Courage lives up to its name against more physical opponents, undauntedly taking on bigger foes with keen technical ability. Forward Mackenzie Geigle has headlined the Oak City-side's attack this season. She started the year as an attacking midfielder, but injuries have moved her to the front line and she has thrived, leading the team with 14 goals, good for ninth in the conference. Defender Laurel Ansbrow is a natural leader on the back line and has anchored the defense this season as the team's most consistent starter. Do-everything midfielder Kate Rodelli is also key in the team's defense and plays an important midfield connector role for the attack. Oakwood brings a deep squad that's also seen all-around improvement during the inaugural Girls' Academy season. Goalkeeper Kaelen Fabry has guided the squad and improved each and every game. The back line has also taken shape in front of her over the course of the year. Defender Kendall Prince has become a team leader at center back and right back Kate Menutis is an attacking threat on the flank with the ability to quickly recover on defense. Lexi Kostinito has grown into a stalwart defensive midfielder, clogging opponent passing lanes and quick to launch the build-up to attack. On the offensive, Sam Forrest's 14 goals lead the team and are top-10 in the conference. Forward Delaney Farina is also an ever-present threat near the net. The front line is fed by central midfielder Amaia Astiasaran, a consistent creator in the middle who has started all but two games for the Connecticut club. Two clubs battling for wild card tickets to the Development Academy playoffs will face off in the day's second feature game. Cincinnati's patient possession will clash with an LA Galaxy San Diego side that prides itself on rapid pace. Both squads are led by recent Youth National Team call-ups and will aim to build momentum as they push for the playoffs. A slew of injuries saw Cincinnati endure a rough start to its spring season, but a 4-0 victory over Shattuck-Saint Mary's last weekend could indicate that the Ohioan club has begun to turn the corner. If a return to form is on the docket, forward Iris Schuh will play a role. The Showcase marks her return from injury, and while there may be rust, her ability to stretch opposing defenses could make her a key figure in the Queen City squad moving forward. She's joined on the attack by forward Erin Fite, whose nine goals lead the team. U-15 Girls' National Team selection Summer Denigan and midfielder Megan Smith serve as catalysts for the attack. Denigan thrives under pressure when she's on the ball while Smith's technical ability and on-field vision make her dangerous in the box. After a successful fall season, LA Galaxy San Diego has had an up-and-down start to the spring campaign. The SoCal squad plays up-tempo and emphasizes quick ball movement. The attack is headlined by midfielder Emily Colton. 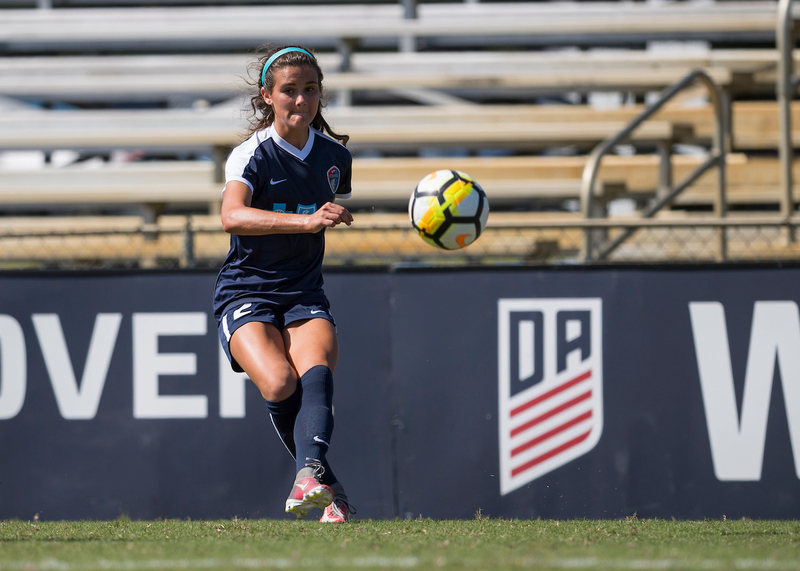 Already committed to the University of North Carolina, she attended last month's U-15 GNT camp with Denigan in Norco, Calif. (LINK) Explosive with the ball, her 23 goals are good for third nationwide this season. On the defense, the Galaxy aim to win the ball back within six seconds of any loss of possession. Those efforts are led by midfielder Abigail Colton and defender Ashlyn Sirani. Colton has a knack for disrupting opponents and has good aerial ability. Sirani has been the rock of the California club's back line this season, starting every game. Not only is she a talented 1-v-1 defender, she is always keen to launch the attack by playing out of the back. Catch the feature games streamed live on ussoccerda.com, the Development Academy Facebook page and U.S. Soccer's YouTube channel!